We are in similar position to what we were in 2013!!! yes....By the looks of it....we sure are. Many who saw the 2013 levels and selected the Large Cap funds to “PLAY SAFE” got sub-optimal returns than those who were BULLISH on the Mid and Small Cap space. Personally feel that the next 4 years will be go either the same way or infact much higher as far equity returns are concerned. As usual, Mid and Small Cap Lovers will make tons of money. Let me Take out whatever is left!! but, the same investor, will not even blink when it comes to selling Equities even at a loss!! 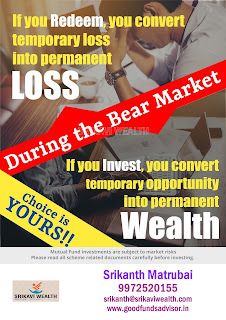 DO NOT ALLOW YOUR NOTIONAL LOSS TO TURN INTO PERMANENT LOSS!! History has proven to us that Gold and Real Estate take many many recover from a Bearish run and History has also proven to us that Equities take very little time to not only recover but also deliver superior returns than these 2 asset classes. 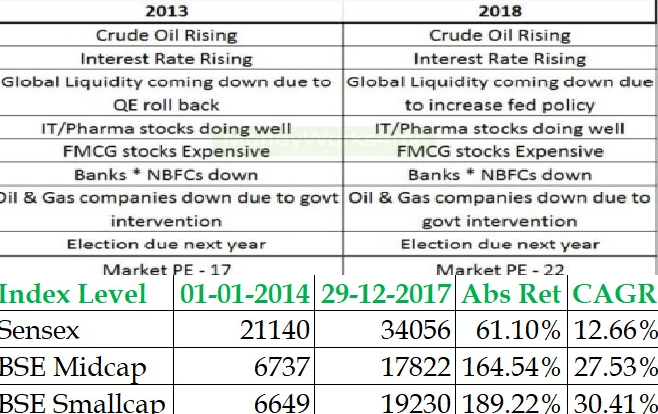 Even today, more than 130 LAKH CRORE money is SLEEPING in FIXED DEPOSITS which clearly shows that Indian investors do not understand the DEVIL OF INFLATION and still prefer the “assumed” SAFE investment....that is FD. If Inflation is considered, then FD has generated NEGATIVE returns. When we are investing in Stock Markets...either directly or through the Mutual Fund route, the simple fact is we are INVESTING IN A BUSINESS. Business is FOREVER and always has its ups and down. No business, will do well all the time. During Tough periods, either they reinvent or re engineer for the next stage. Business people WILL NEVER QUIT due to the downturn in their business and prepared to ride the volatility. 31st January 2018 is the date which every investor will be looking at almost always.....as that is the day that Long Term Capital Gain Tax is applicable from. Yes....your portfolio would have come down about 10% to even maybe 15% from that date. But, this has happened many times before and Markets have bounced back with a vengeance every time. And this kind of falls will again happen in future too. Its inevitable. Many keep asking me....."is this the repeat of 2008 Fall"?? BUT, IT ROARED BACK TO 21,000 BY 5TH NOVEMBER 2010. The Bounce Back is sharper and BIGGER each time!!! Nothing is permanent in Life. The Markets have their own minds and keep going through these phases of volatility. And sadly, many investors (especially,, actually STOP their SIP during these falls. Absolute Foolishness!!! SIP is exactly designed to create Wealth from these kind of falls. In fact, if possible, YOU SHOULD ACTUALLY INVEST LUMPSUM OR INCREASE when these kind of falls happen. These are Opportunities to be used. 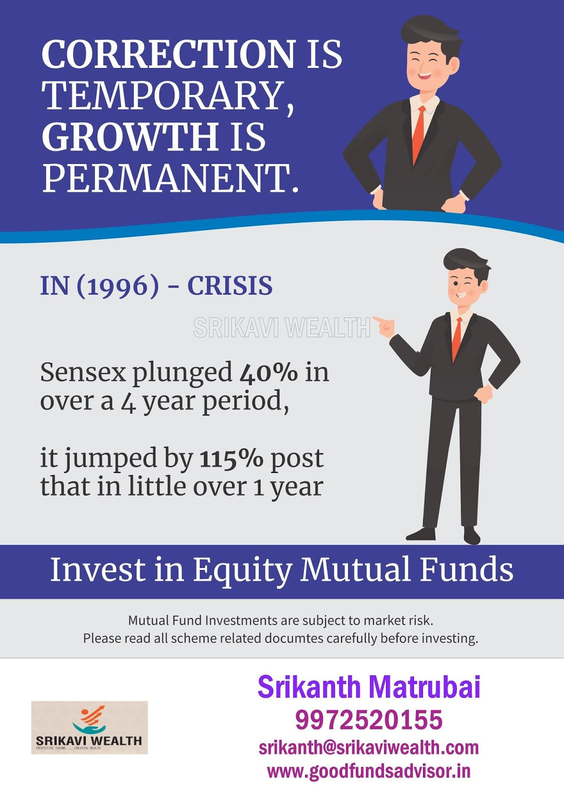 SIPs are actually more Beneficial in a Downward Market than in a Upward Market!! Stopping SIP and worse, Redeeming at this point of time will only convert your temporary Notional Loss into a PERMANENT REAL LOSS!! In investing as in auto racing, you don't have to win every lap to win the race, but YOU ABSOLUTELY DO HAVE TO FINISH THE RACE. You, my dear investors, belong to that RARE AND UNIQUE 5% of the Indian Population who believe in the Power of Equity and the India's Growth Story and most importantly, you understand that the MUTUAL FUND route is the BEST way to achieve all your LONG TERM FINANCIAL GOALS. 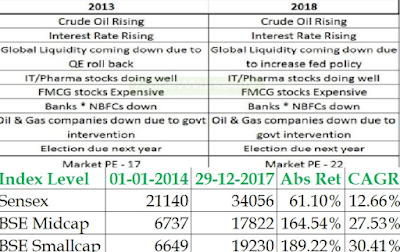 As your Well Wisher, I can assure that this too is a passing phase and the Equity Returns will bounce back and bounce back with a vengeance. As your Well Wisher, I keep a close eye on your portfolio and will keep you posted on all updates as usual. YOU CAN BE 100% SURE THAT YOU ARE IN SAFE HANDS. 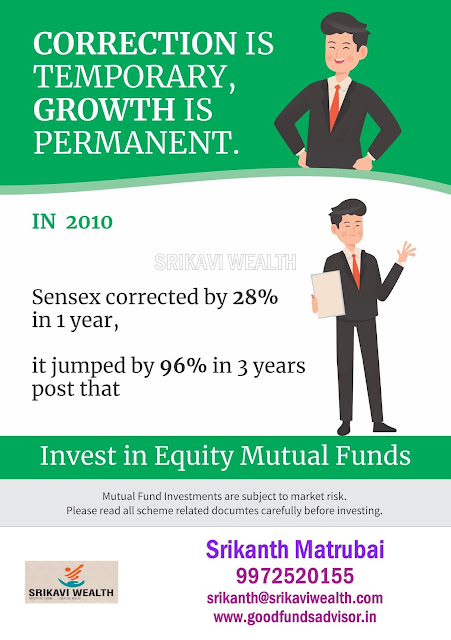 And, just like GOLD and Real Estate, your Equity Mutual Fund investment too needs to be nurtured for LONG TERM. 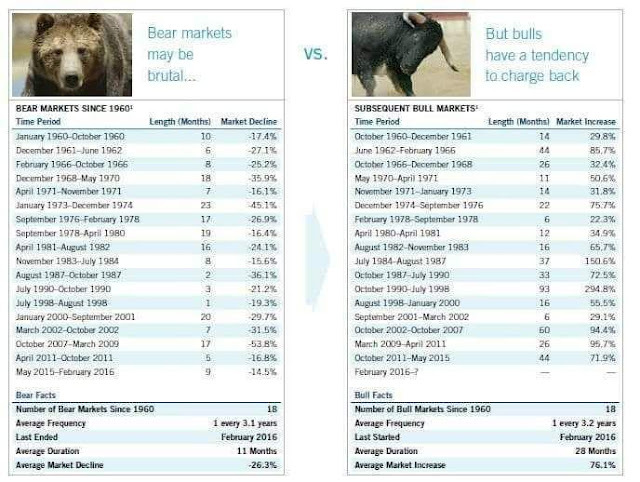 Nobody likes to see their portfolio going DOWN but its essential to remember that these are NOTIONAL LOSS. But Creating Wealth requires patience and only those who pass this test will get rewarded and rewarded handsomely!! Patience is not the ability to wait but the ability to keep CALM WHILE WAITING!! Good points you mentioned in the article like why investors not considering the equity as like a gold and real estate. Yes. 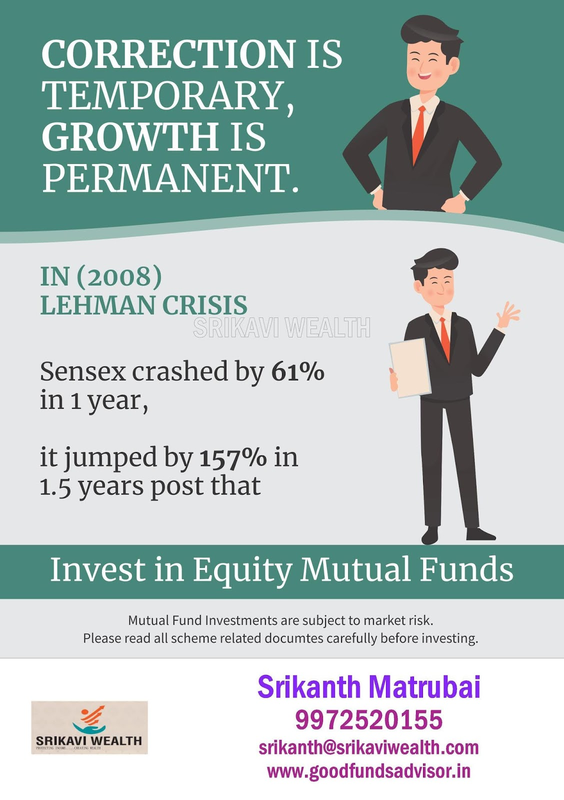 Investor need to stick for asset allocation and also long term in equity. Good points raised in the article. 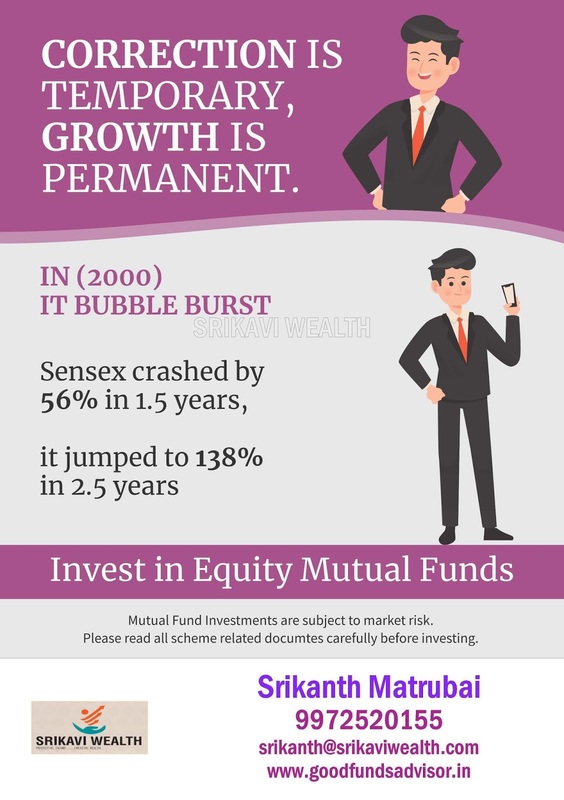 Nice read... Well articulated.. it's obvious scary however patience is the key here since we all have seen the biggest carsh of sensex in history and way it bounced back. Its just a phase and will pass by too. 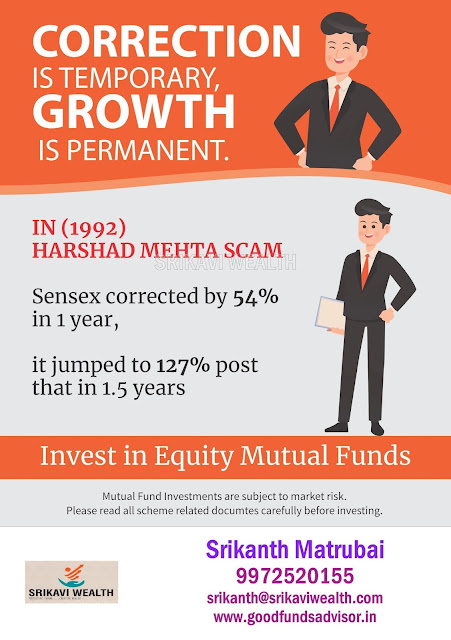 I have never heard anyone saying they lost money in mutual funds till date which clearly shows however the market performs they will keep your investment intact and will allow you make profits in you are patience enough..